Vestil adjustable height gantry crane. Industrial steel gantry cranes are designed for transporting and positioning materials. Solid steel construction will provide years of service. Large 8-inches diameter locking phenolic casters with roller bearings will facilitate easy mobility from one area to another when unloaded. Height is adjustable in 6-inches increments. Blue finish. More economical and flexible than permanent cranes. Features quick setup design. Hoist and trolley sold separately. Beam measures 10-feet length by 8-inches height. Under I-beam usable height range is 90-inches to 144-inches. 77-inches base and 4-inches flange width. 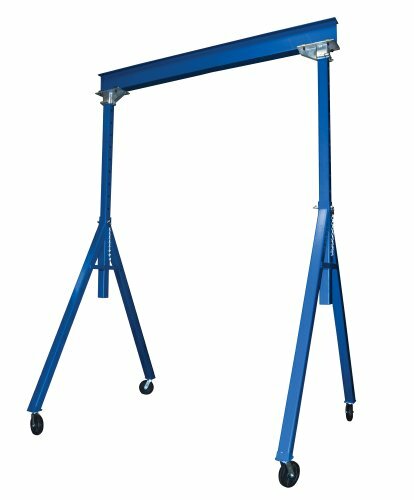 Buy Vestil AHS-4-10-12 Steel Adjustable Height Gantry Crane, 4000 lbs Capacity, 10′ Length x 8″ Height Beam, 90″-144″ Usable Height at Discounted Prices ✓ FREE DELIVERY possible on eligible purchases.